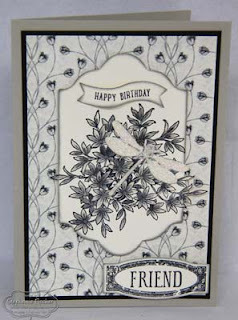 The Crafty Thinker: Stephanie Fischer - Independent Stampin' Up Demonstrator: Several Shades of Grey! There are so many beautiful stamp sets and papers in the new catalogue that I'm like a kid in a candy shop at the moment! Yesterday I had some time to play and decided to try the Timeless Elegance DSP. I just love it! It's so gorgeous it really does all the heavy lifting for you, making it really quick and easy to create a beautiful card! How good is that?! In just a short space of time, with the addition of of the Watercolour Wonder and Awesomely Artistic stamp sets I made these three cards. By just letting the beautiful prints on the DSP do all the talking, I could have made even more! I used the Out of the Box technique to cut out the stamped panel with the new Lots of Labels Framelits. 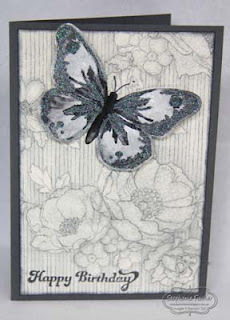 I stamped the dragonfly with versamark onto Very Vanilla card, applied heat & stick powder and then dazzling diamonds. I highlighted around the wings with an aquapainter and basic grey ink. I watercoloured the Awesomely Artistic foliage with Sahara Sand and Basic Grey inks. The die cuts were edged with Basic Grey ink. I stamped the frame and the word "Friend" from the Awesomely Artistic set and cut it out with the matching framelit from the Project Life Cards & Labels Framelit set. Happy Birthday is from the Sprinkles of Life set. Since it's photopolymer I was able to bend it to fit the Bitty Banner Framelet. I layered the Timeless Elegance DSP onto Basic Black cardstock and then onto the Sahara Sand card base. 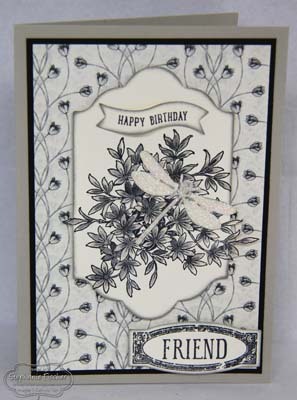 The sentiment on the striped card is from Birthday Blossoms. I hand cut the Very Vanilla layer to points and layered it onto Sahara Sand cardstock cut with another of the Project Life Cards & Labels Framelits. Then I applied two of the smallest of the metal rimmed pearl embellishments. I stamped the Watercolour Wings butterfly with Sahara Sand, Basic Grey and Black. The Timeless Elegance DSP is layered onto Basic Black and then onto the Sahara Sand card base. Both the butterfly and the sentiment are popped up on dimensionals. 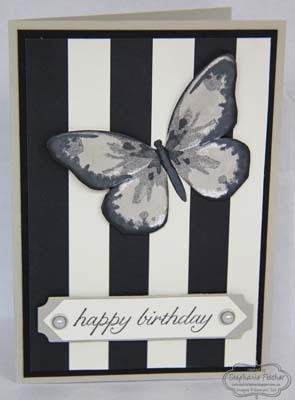 For the last card, the Timeless Elegance DSP is edged with black ink and layered onto the Basic Grey card. The sentiment is from That Thing You Did and I stamped it in black directly onto the DSP. The Watercolour Wings butterfly is stamped in black and Basic Grey. I then picked out parts of it with the 2-way glue pen and applied Dazzling Diamonds glitter. The wings are popped up on dimensionals. In the next few weeks I'll post more pictures of what I make with some of the new products.